I can't believe how close we are to the end of the 30-Day Disney Challenge! I have a really crazy weekend ahead of me, so I'm sneaking this post in early today. 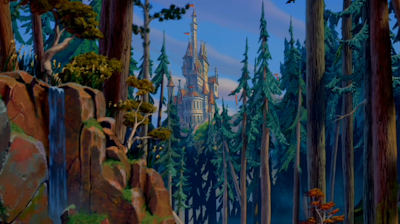 Who doesn't love all of the beautiful castles in the Disney universe? I honestly love them all and would like to live in most of them. Anyone know how that can be arranged? My favorite is the Beast's castle. 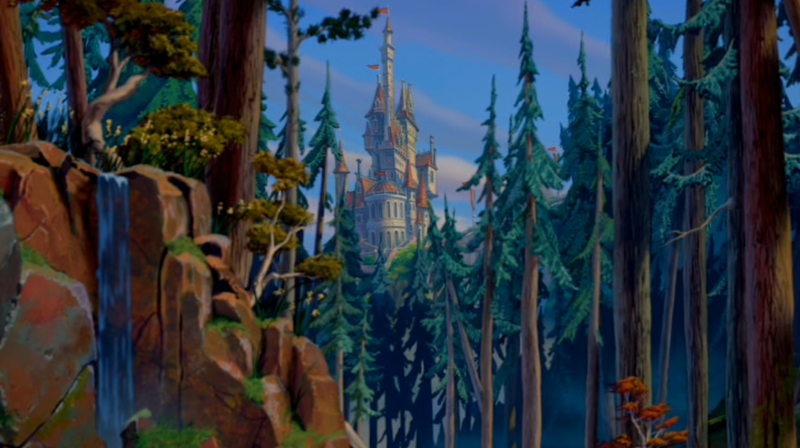 I've been captivated by this shot in the movie where you first see it among the trees ever since I was a little girl. It's hidden away in a forest, it has two versions (cursed and not cursed), and just looks mysterious and intriguing. The gargoyle statues freaked me out a little when I was young, but that holds no weight on my decision! I am so excited that the next time we visit Disney World, I'll be able to see a real-life version! Speaking of real-life, I've only seen one castle in the parks: Cinderella's Castle. It is one of my ultimate dreams to spend a night (or a year? I can dream, right?) in the amazing Cinderella suite. Since it appears that is only an option for the extremely rich and/or famous, I don't know that I will ever get the chance. But oh my goodness. It would be the most magical thing ever.